SINGAPORE, August 22, 2014 - Australia and Singapore vowed Friday to enhance intelligence sharing in the face of growing fears about the threat posed by jihadist citizens returning home after fighting in Syria and Iraq. Ministers from both countries warned of the rising risk posed by the returning fighters who are radicalised and have developed sophisticated skills to carry out terror attacks. "In this context of counter-terrorism and counter radicalisation... we felt that we could exchange more information because these threats if they materialise will affect all citizens of all races and all religions," Singapore Defence Minister Ng Eng Hen said at a joint press conference with Australian Foreign Minister Julie Bishop. 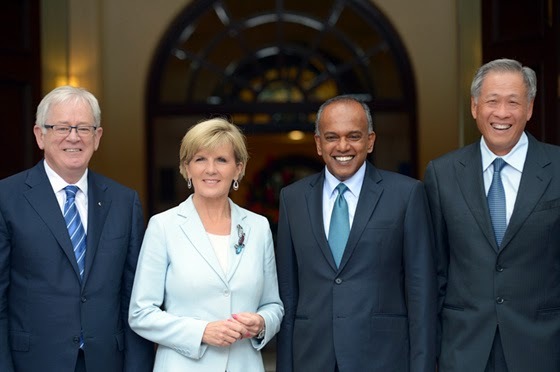 Senior Australian government officials led by Bishop are in Singapore for bilateral meetings. Bishop said Canberra is "also in discussions with our counterparts in Indonesia, Malaysia, and the Philippines as this is not an issue that is isolated". "If these foreign fighters as they are called, come back to Australia, come back to our region, then they pose a threat," she said. "They are hardened, experienced extremists who have undertaken in a number of instances, terrorist activities overseas," she added. Australia's assistant Defence Minister Stuart Robert said the enhanced information sharing with Singapore will cover "the areas of terrorism, extremism, foreign fighters and the growth of homegrown extremism". The United States and Australia this month agreed to take concerns about jihadist foreign fighters in the Islamic State terror group to the United Nations. The group has overrun parts of Syria and Iraq and have declared a Muslim caliphate in those areas. As many as 150 Australians are said to be fighting alongside the group overseas, including at least one Sydney man and his young son who have posed for photos with a severed head. Prime Minister Tony Abbott's government is hardening laws to make it more difficult for citizens to travel from Australia to fight in the Middle East, and easier to arrest them on their return. Singapore in July said it is aware of two Singaporeans currently fighting in Syria along with their families. Authorities in October 2012 detained a man who attempted to travel to Syria to join the jihadists, while two others have had their movements restricted after their attempts to contact the militant groups. Neighbouring Malaysia has detained 19 Islamic State-inspired militants who had allegedly plotted to bomb pubs, discos and a Malaysian brewery of beer producer Carlsberg. In Indonesia, the world's biggest Muslim-majority nation, authorities estimate that 60 of its citizens have joined the fighting in Syria and Iraq.